Israeli security forces have shut down a massive al-Qaeda plot coordinated by terrorist mastermind Ayman al-Zawahiri that involved attacking the Jerusalem Convention Center and the American embassy in the diplomatic center of Tel Aviv. This is believed to be the first time that al-Qaeda chief al-Zawahiri has gotten personally involved in engineering strikes within Israel. The foiled plot is a sobering reminder that al-Qaeda has been experiencing a comeback in the Obama era. Weeks before the November 2012 election Obama bragged, "al-Qaeda is on the path to defeat and Osama bin Laden is dead." It is true that al-Qaeda is "on the run," but not in the sense that President Obama uses the term. The stock of the international Muslim terrorist network is experiencing a bull run in many corners of the world, lifted higher by the profuse pro-Islamist promises of appeasement offered by Secretary of State John Kerry. Meanwhile, the Shin Bet (Israel Security Agency) told the Jerusalem Post Wednesday that it arrested three Palestinians from east Jerusalem recruited online by a Gaza-based al-Qaeda operative. The three men were preparing to launch a wave of terror attacks involving bombs and firearms that would have targeted the Jerusalem Convention Center, a bus route, the U.S. embassy in Tel Aviv, and the emergency responders who would have attended to the wounded at the attack sites. A U.S. State Department official suggested that the plot against the diplomatic facility had been a matter of discussion between the American and Israeli governments for some time. "The U.S. embassy was not just the target, but obviously other targets were involved as well in the threat," State Department spokeswoman Marie Harf said Wednesday. The U.S. won't be evacuating the embassy, Harf said. "We obviously don't discuss all of our security measures." The Shin Bet said al-Qaeda operative Ariv Al-Sham used the Internet to sign up Iyad Khalil Abu-Sara, Rubin Abu-Nagma, and Ala Anam for the violent campaign. At press time it was unclear if Al-Sham was in Israeli custody. 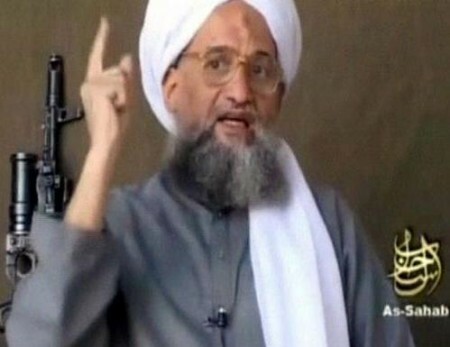 The Shin Bet said he received orders directly from Ayman Al-Zawahiri, Osama bin Laden's successor as head of al-Qaeda. Abu-Sara confessed he volunteered to carry out a "sacrifice attack" on an Israeli bus traveling between Jerusalem and Ma'ale Adumim. The plan was to shoot out the vehicle's wheels, causing it to turn over, and then to gun down passengers and first responders. The suspect also confessed he planned to participate in simultaneous suicide bombings at the U.S. Embassy and the Jerusalem Convention Center. Abu-Sara would have killed responders at the convention center by detonating a suicide truck bomb at the scene. "Al-Sham and Abu-Sara plotted to bring a group of foreign terrorists to Israel using fake Russian passports, who would have entered the country by posing as tourists," the newspaper reported. "Abu-Sara was meant to receive the terrorists, and prepare their suicide bomb vests and a truck bomb. Abu-Sara was also supposed to travel to Syria for training in combat and explosives manufacturing, and had purchased a flight ticket to Turkey, a gateway to Syria." Abu-Nagma admitted he intended to kidnap a soldier and bomb a building housing Israeli Jews in east Jerusalem. Ala Anam admitted planning to establish a Salafi-Jihadi cell in Samaria for the purpose of launching terror attacks. The Jerusalem Post quoted an unnamed source saying the new arrests are proof that al-Qaeda-affiliated elements — as well as operatives from Hamas and Islamic Jihad — are using the Gaza Strip as a terrorism base. "Hundreds of Salafi-jihadis in Gaza have access to rockets and arms, and travel to Sinai to attack both Egypt and Israel," the source said. News of the foiled plot runs counter to the Obama administration's fanciful insistence that al-Qaeda no longer matters and its denial, on display in a recent interview with the New Yorker, that al-Qaeda-affiliated terrorism is spreading rapidly around the globe. After some major setbacks in recent years, al-Qaeda's influence is growing as it establishes and fortifies terrorism beachheads throughout the Middle East and North Africa. Al-Qaeda's affiliate al-Qaeda in Iraq (AQI) now controls large chunks of Iraq. The group "is trying to take over two countries at once; Iraq and Syria," as Daniel Greenfield notes. "It's a big goal, but it knows that in Syria, Obama will help them and that in Iraq, he won't do anything to stop them." AQI, "a predominantly Sunni jihadist group, seeks to sow civil unrest in Iraq and the Levant with the aim of establishing a caliphate—a single, transnational Islamic state based on sharia law," according to the Council on Foreign Relations. Burgeoning violence in 2013 left nearly eight thousand civilians dead, making it Iraq's bloodiest year since 2008, according to the United Nations. Meanwhile, in 2012 the group adopted a new moniker, Islamic State of Iraq and Greater Syria (ISIS, a.k.a. Islamic State of Iraq and the Levant, or ISIL) as an expression of its broadened ambitions as its fighters have crossed into neighboring Syria to challenge both the Assad regime and secular and Islamist opposition groups there. Al-Qaeda itself "remains a cohesive organization" and its core "leadership continues to be important to the global movement," according to the National Counterterrorism Center. Despite continued leadership losses, al-Qa'ida remains committed to conducting attacks in the United States and against American interests abroad. The group has advanced a number of unsuccessful plots in the past several years, including against the United States and Europe. This highlights al-Qa'ida's ability to continue some attack preparations while under sustained counterterrorism pressure and suggests it may be plotting additional attacks against the United States at home or overseas. Islamists are increasingly emboldened by America's projection of weakness abroad and by the Obama administration's dogmatic determination to undermine the government of Benjamin Netanyahu. Chances are the terrorist networks will grow even stronger before President Obama leaves office in January 2017. We're going to be seeing a lot more islam0fascist terrorism in the US -- especially considering muslimes are infiltrating/subverting/corrupting our legislative/judicial and law enforcement agencies. It is Islam against the West and the only people who seem to understand this are the muslims. Don't be fooled. obama is an idiot because he believes in so much that is not true such as the viability of socialism, but the 'failed' results of his policies and actions are not due to incompetence, they are his goals. Those things which most rational people see as policy failures are in fact policy successes as obama's goals are to weaken America and strengthen America's enemies, of whom he is a member. right now. The peace of the grave. No one is talking about killing Muslim civilians. Nonetheless, infidels the world over are raped and slaughtered mercilessly by Muslims. Why? It's because Islamic totalitarian law, otherwise known as Sharia, sanctions it. The US is a sick country. Everyone with a little money start doing drugs to deal with the inner pain caused by capitalism and atheism - there is no morals left in your country. That is why Islam is growing so fast. The USA is the richest and most powerful country the world has ever witnessed and it got to be that way, not through Marxism or Islamism, but instead through Capitalism. Indeed, no other economic system has lifted up more people out of poverty and into opulence and affluence other than capitalism. Meanwhile, Marxism and Islamism, both very rabid forms of totalitarianism, have miserably failed every time they have been tried. Indeed, even the oil rich Islamic countries combined when compared to the USA, pale in comparison. Heck, even tiny Israel is far richer than the richest of the oil wealthy Islamic totalitarian hellholes thanks to Capitalism. Meanwhile, the Islamic world can't even drill and produce its own oil without the West. Hence, while the USA may be currently suffering temporarily from a crisis caused by Marxism, the pendulum is due to swing back very forcefully in the near future. Don't make the same mistake the Japanese made and under estimate the USA because you will have heck to pay. Meanwhile, even a Marxist hijacked USA can reduce the Islamic world to just molten sand with the push of a button. Just read a report on Arutz Sheva, an Israeli News outlet, that states that American official sources doubt the validity of the whole plot. They seem to try to smear the Israeli security agencies. So, maybe the Mossad and Shin Bet should stop telling their allies about threats at all and have their embassy blown up? Is that how the US state department acts to secure their personal overseas? Looks like whatever gets in the way of their Islamic fairy tail that paints murderers, terrorist and evil dictatorships as kinda freedom fighters - anyone has heard that before like in South east Asia or Nicaragua- has to be thrown into the Orwellian Change-the-Meaning machine. Actually, AQ consist of violent jihadists everywhere that can materialize and dematerialize as the situations call for. They are not this monolithic terrorist group that constitutes the radical Muslim extremists population of Muslims that misunderstand the "religion of peace" as the Dhimmicrat and Republican PC multiculturalists on both sides of the political divide fantasize about and would have you believe nonsensically. As a matter of fact, in Islam waging jihad (holy war) in the cause of Allah to ultimately make Islam supreme is not only a holy obligation incumbent upon all mainstream orthodox Muslims in the world in one form or another, it is also the only path to salvation for all Muslims as well. Hence, all mainstream orthodox Muslims in the world are jihadists in one form or another, either violent jihadists as in the fantasy based PC multicultural created AQ international terrorist group, (a tiny minority of Muslims), or non-violent stealth and deceptive jihadists, (the vast overwhelming majority of Muslims). Now for those Muslims who openly choose not to wage jihad in the cause of Allah to ultimately make Islam supreme, their fate is death, as blasphemy and apostasy in Islam, as opposed to in actual faith-based religions, are capital offenses. Indeed, the very fact that Islam imposes capital punishments on those adherents that choose not to remain loyal to Islam sets Islam apart from being an actual faith-based religion as it masquerades as being to dupe its intended victims. Islam instead is a very rabid form of mind control, which blocks the freedom of conscience to choose not to remain loyal to Islam via capital punishments for blasphemy and apostasy, and therefore is a very fanatical totalitarian cult. Indeed, other than the very fanatical totalitarian cult of Islam, what actual faith-based religions like Islam also automatically condemns their adherents to death for blasphemy and apostasy who for some reason or another choose not to remain loyal? The answer, of course, is none of them and Islam is very alone in that respect, proving once and for all that Islam is not a religion at all and thus technically is not protected under the 1st Amendment of the US constitution. Now, of course, all PC multiculturalists consider Islam to be a religion and all cultures around the world to be worthy and equal, but like Muslims, PC multiculturalists don't have the first clue about what constitutes religion and therefore aren't qualified to make life and death judgments. Thus, any individuals who are deemed to be a so-called moderate Muslims in the eyes of PC multiculturalists, that is they are considered to be exactly like the adherents of actual faith-based religions, are in reality blasphemous apostates that according to the texts and tenets of Islam must be executed. Hence, the existence of so-called moderate Muslims in Islam is a fantasy that doesn't actually exist in reality. Indeed, they only exist within the recesses of the minds of people duped by PC multiculturalism. As a matter of fact, the millions of Muslim immigrants that have migrated to America and the Western infidel world since in the '70's with all of their excess baggage are actually non-violent stealth and deceptive jihadists infiltrating our infidel world for the strategic purpose of demographic conquest. Indeed, take a look around the world and you don't have to be a rocket scientist to figure it out, in every case mass Muslim immigration with all of its excess baggage has turned into an unmitigated disaster everywhere where it is occurring. Therefore, the biggest threat emanating from the fanatical totalitarian cult of Islam is not from violent jihad that is minimized as the product of radical Muslim extremists who misunderstand Islam and perpetrate terrorism by the PC multiculturalists on both sides of the political divide in America. Instead, it is through mass Muslim immigration with all of its excess baggage to the infidel world that in reality is really non-violent stealth and deceptive jihad for the long-term strategic purpose of demographic conquest, and if I'm somehow wrong, then someone please by all means point to just one specific example of Muslim immigrants actually assimilating and integrating, then matriculating into contributing and productive citizens of their new host infidel country anywhere in the world. Further, it would be ludicrous for the USA to emulate the previous two fantasy-based nation-building missions in Iraq and Afghanistan that inevitably turned into the two biggest strategic blunders ever in American history, as that would surely lead to the subjugation of the infidel world into Islamic totalitarianism.